The driver of a silver car could hold key information following a crash on the A605 near Oundle in which two men died. Police would like to hear from the driver of a silver car who was seen at around 6am on Sunday, May 7, dropping a man off at Haddon Services. 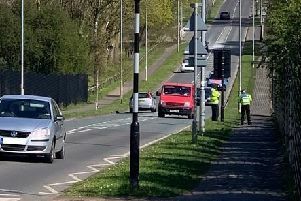 Officers believe the CCTV shows the 19-year-old man, who was arrested by police following the crash on two counts of death by dangerous driving and one count of serious injury by dangerous driving, getting out of the silver car having caught a lift from somewhere in the Elton or Haddon area. There is no suggestion that the driver of the silver car was anything other than a Good Samaritan giving a young man, who was later treated in hospital for his injuries, a lift. However, police believe the driver may have information key to the investigation into the fatal collision, which took place at around 2am on Sunday, May 7, near Elton. Two men were killed in the crash and a woman remains in Addenbrooke’s Hospital in Cambridge with serious but not life-threatening injuries. The 19-year-old is believed to have fled the scene and taken a lift in the silver car before being arrested by police later. He has since been released on police bail until August 1. Formal identification has not yet taken place so police are unable to name the two people who died at this time. The road was closed in both directions between Haddon services and Elton for 18 hours. Anyone with information about the silver car, or if you were the driver who gave the young man a lift on Sunday, please call PC Jay Porter on 101.